One of my favourite features of the island we added to the kitchen is the open shelving on the end that holds our cookbooks. 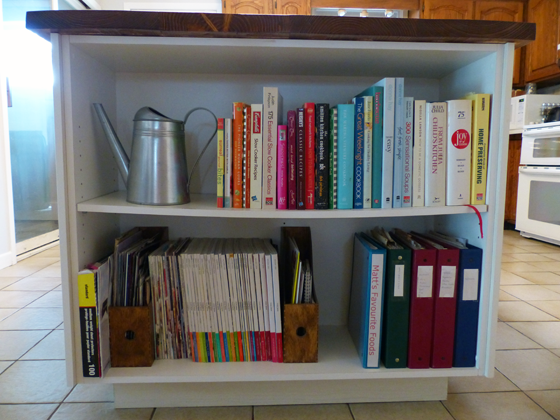 The books add a splash of colour to the wood and white of the kitchen. The shelves keep them organized and easily accessible. Plus I love cookbooks. I will sit and read them like a magazine or novel. (And, yes, you’re not imagining. The upper shelf is sagging a bit under the weight of all of our cookbooks). 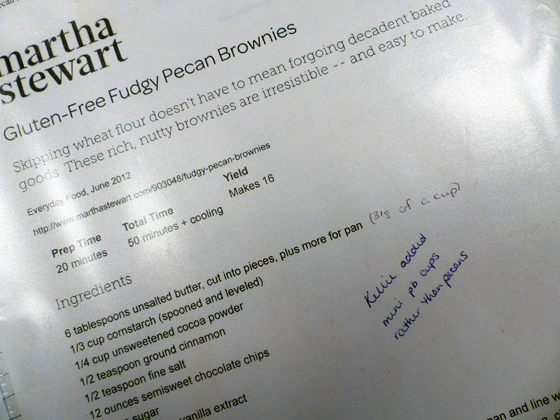 However, not all of my recipes reside in cookbooks. I have a bunch of printouts from recipes I’ve found online (I haven’t progressed to a tablet yet), clippings from the newspaper or magazines, even a few hand-written recipes from family and friends. 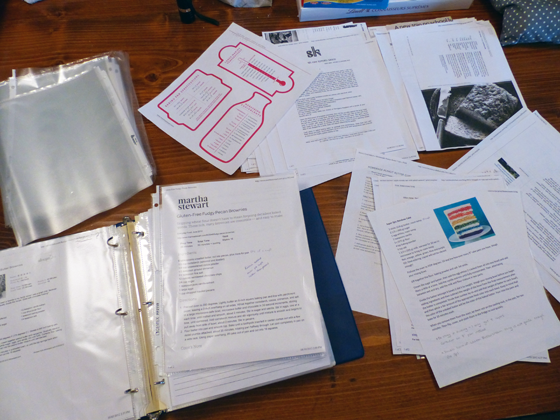 To keep these recipes organized, I returned to the lessons learned in school–binders, dividers and page protectors. A couple of weeks ago, I added a bunch of new recipes to my collection, so I thought I’d share my organization method with you. First are the binders. 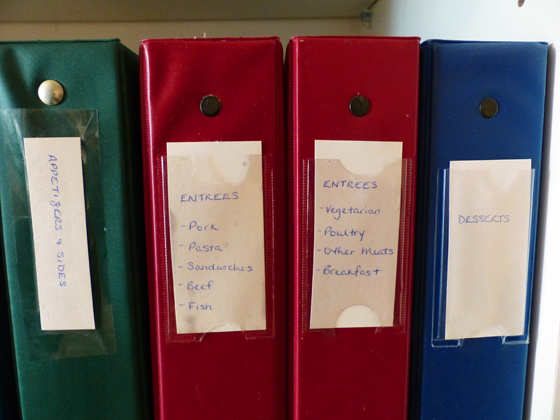 I have three major categories which each get their own binder: Appetizers and Sides, Entrees, Desserts and Sweets. Entrees outgrew its single binder and is now split into two books. I use different colours for each grouping. 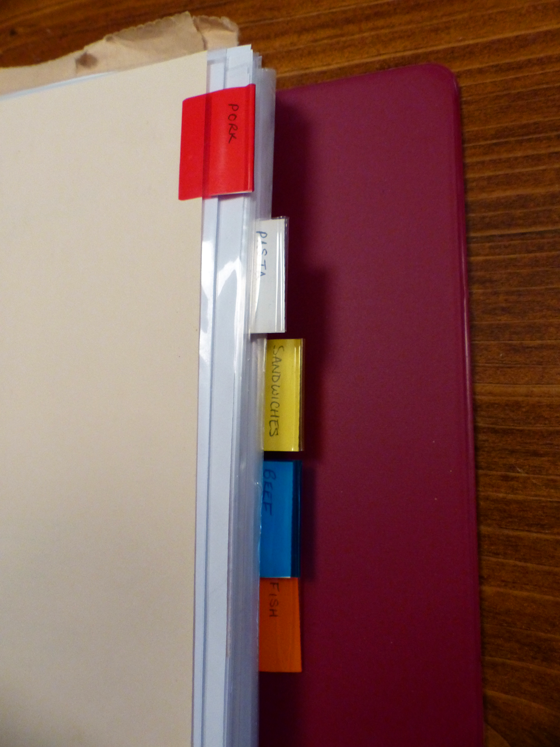 Within each binder, I’ve divided the recipes into subcategories. In appetizers, the sections are appetizers, soups, salads, sides, snacks, breads and drinks. For entrees, I divided them into pork, pasta, sandwiches, beef, fish, vegetarian, poultry, other meats (venison, lamb), breakfast. Desserts starts with the most important, chocolate, and then goes to cookies, “buns” and bars (including muffins), cakes, pies, fruit, custards and Christmas. The recipes themselves are stored in plastic page protectors. I’m not the tidiest cook, so the plastic sleeves protect the paper from spills and splashes. However, it’s easy to slide the recipe out of the plastic and add notes about what worked, what didn’t or what adjustments I made. 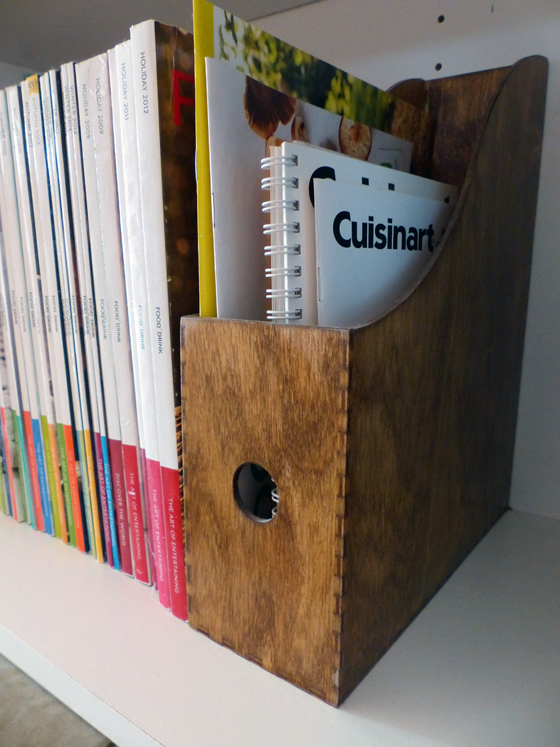 Beyond the binders, I also use magazine holders to organize the smaller pamphlets and cookbooks I’ve collected over the years. I got two wooden holders from Ikea and stained them to match the countertop and cabinets. I love having my recipes organized. 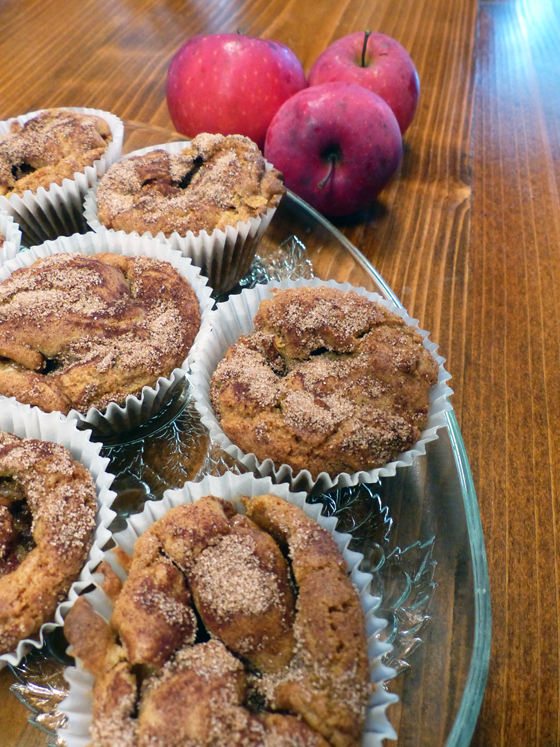 In fact, I was so inspired that I flipped through the dessert binder and whipped up one of my favourite fall recipes, spiced apple muffins, using the apples my friend gave me from her own tree. With my recipes all organized, I feel ready to move on from fall baking on to Christmas baking. Are you doing any baking, either fall or Christmas? How do you organize your recipes? I’m finding more free time now that the weather has turned. Although I think Blitz keeps you busy no matter what the weather!